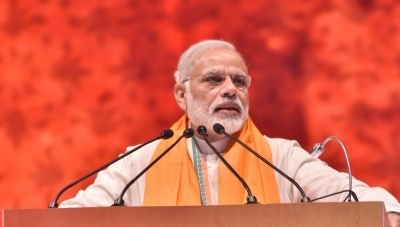 New Delhi Sep 15 (IANS) Prime Minister Narendra Modi on Saturday described river Ganga as our "culture heritage and identity" and urged people to contribute towards cleaning it. "I want to thank the people of Bijnore for working towards cleaning the Ganga " Modi said while interacting with the people of the Uttar Pradesh district during the launch of the Swachhata Hi Seva Movement (cleanliness is true service) as a tribute to Mahatma Gandhi through the NaMo app. "And banks of river Ganga becoming open defecation free shall be an important stage towards maintaining the purity of the river " Modi said. "Devotion towards the Ganga and Gangotri should not only be shown but steps should be taken and for that. We also need to ensure that mentality to harm Ganga should also be removed from the mindsets of people " Modi said. Appealing to the people residing near the banks of the river Modi asked: "Will you all participate in the cleanliness mission to Ganga clean? I know that like people of Bijnor many others would join the cleanliness movement. Modi also said that his government was taking a lot of steps to clean Ganga and soon its results would be visible to everyone. Modi also interacted with the railway personnel in Haryana s Rewari and said that the Indian Railways has done commendable work in furthering cleanliness. "In every train coach it is written that Indian Railways is public property. It is written to give a sense to people to adopt it as their own and keep it clean." Hailing the railway personnel for keeping the coaches and stations clean Modi said: "Today the kind of cleanliness seen in Indian Railways is due to the hard work of the railway personnels."